The History of Bond Rates Past or Prologue? | DiNuzzo Index Advisors, Inc. The History of Bond Rates Past or Prologue? Although stocks get the most attention, bonds are significant contributors, both to your total return on your portfolio, and also to the prices of every other investment. Bonds compete with stocks and real estate for investment dollars; when their yields are high, it causes a shift in demand away from those "risk" assets, and tends to lower the price of a dollar of corporate earnings. When you look at the long-term history of bonds, shown in the graphic, you see that the time period following World War II can be divided into two distinct periods. Since 1945, when 10-year Treasury yields bottomed out at 1.7% a year, there was a long period when bonds became more competitive with stocks. That period ended with an all-time high for 10-year Treasuries of 15.8%. The latter part of the run-up was not a great time to be invested in stocks, with the 1974-75 bear market following and then leading a long sideways doldrums in share prices. The annotated chart doesn't note that the long bull market in stocks started the year that bond rates started their long decline, but it does show that since 1981, bonds have become less and less competitive with other asset classes. The recent jump in rates is actually in line with other incidental bumps that would give way to sharp declines in a long downward trend that has lasted more than 35 years. Many analysts worry that the trend could turn around-although, to be fair, some of them have been boldly predicting a rise in bond rates for the better part of seven years. But the underlying issue is that when bond yields DO eventually turn back upwards again, the result could be the same as it was during the run-up in the 1970s: a long, extended period where stock returns underperformed their long-term averages. 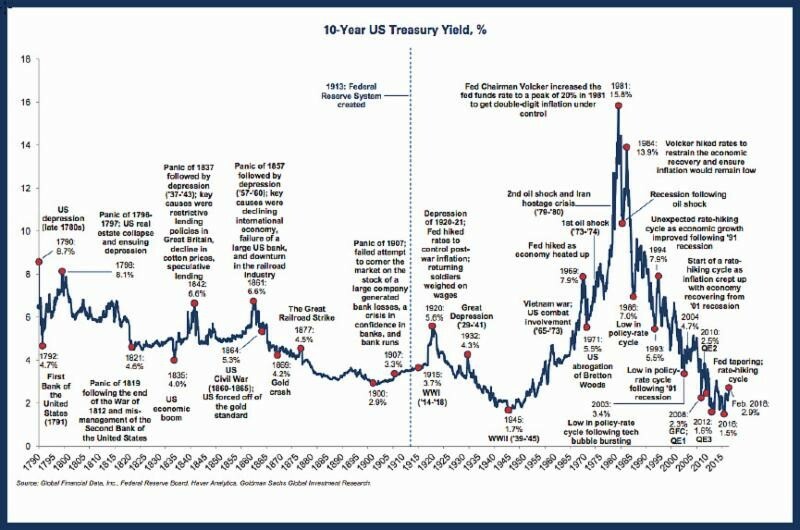 Whatever conclusion you draw about the future, the chart is surely one of the most interesting annotated guides to bond market history most of us have ever seen.